Comparing the photos of the Cadillac experimental and show models that preceded the prototype Eldorado Brougham of 1955, one is struck by the similarity of design between them. Of note too is the fact that many of the innovative styling features used on these experimental prototypes and so-called "dream cars" found their way onto and into many subsequent Cadillac production models. 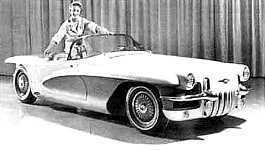 The mother of all dream cars was Harley Earl's Y-Job, built on a Buick platform. Begun in 1938, it was not completed nor shown publicly until 1941. Earl who, by 1939, was already a vice-president of the vast GM corporation, used the Y-Job for some time as his personal transportation. Like the later production Eldorado, the Y-Job featured a convertible top boot that was flush with the rear deck, giving the car a smooth, streamlined appearance. GM's Le Sabre 2-passenger experimental roadster, job #XP-8 (special order # 9830), was completed in December 1950, again on a Buick platform. It gave Cadillac the "gull-wing" front bumpers and wrap-around windshield, both so popular in the fifties. Its stubby tail fins definitely spelled "Cadillac"; these appeared - with only minor modifications - on the Cadillac Park Avenue show car (1954), a car that greatly influenced the Eldorado Brougham prototype design the following year. A modified version of the specially cast wheels used on Le Sabre and on subsequent "dream cars" of the fifties, appeared later on the stock Cadillac Eldorado for 1955. They were used subsequently on all the Eldorado models (except the production automatic top, that would raise the top automatically if a raindrop fell on a water sensor mounted on the rear deck. Although the automatic top never went into mass production, Cadillac did experiment with it once again in 1953, on its Le Mans roadster and in 1958, when it built a half dozen Eldorado Biarritz convertibles that were so equipped. This Cadillac dream car was first exhibited at Cadillac's 50th Anniversary extravaganza in 1952, in company with the more sedate Townsman model, a modified Series Sixty Special, 4-door sedan. 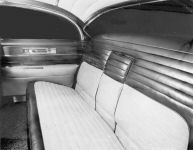 The Eldorado was specially designed and appointed to symbolize Cadillac's Golden Anniversary of fine car manufacturing. It gave birth the following year to the limited-production Eldorado convertible. Many features found on Cadillacs Le Mans roadster of 1953 were carried forward from Le Sabre, particularly the windshield design, the sabre-spoke wheels, the 2-seater roadster configuration and the gull-wing front bumper. Le Mans was displayed on Cadillacs revolving stand at the 1953 GM Motorama; the backdrop was a night scene from the renowned road race of the same name; it was painted by French artist Claude Genest. Cadillac chose the name Le Mans to commemorate the successful participation of two Cadillac automobiles in the 1950 edition of that race. These two cars were (a) a stock Series 61 coupe and (b) a barquette or tank that had been modified by Frick-Tappet; the latter was nicknamed Le Monstre (meaning the monster, in French). I have seen it sometimes spelled Le Manstre (an extension of Le Mans). The French journalists nicknamed the regular coupe, Petit Pataud. The literal translation of the French word pataud is pup with big, thick paws. So, petit pataud would be an even smaller pup with the same demeanour. In this case, however, the person who coined the expression (a French journalist, I believe) was merely punning the more readily understandable and homophonous petit bateau, meaning small boat. Is not a Cadillac a land yacht? In the expression petit pataud the adjectival rather than nominal sense of the word pataud is intended, meaning low, heavy-set and clumsy. Both cars performed well; the stock coupe took 10th place while the tank came in 11th, despite it having hit an embankment during the race and suffering considerable frontal damage. Of note also is the fact that a Cadillac-powered Allard J2 took 3rd place. The fiberglass-bodied Le Mans roadster was powered by the successful Cadillac motor, appropriately modified to churn out 250 HP, while the stock Cadillac had been boosted to 210HP from the factory's original 160HP. Described by Cadillac merchandising copy-writers as having racy sports car styling combined with rare elegance, Cadillac's Le Mans featured specially embossed seat leather, inter alia. The hood emblem, wheel discs and instrument panel surfaces were specially engraved by a renowned jeweler. 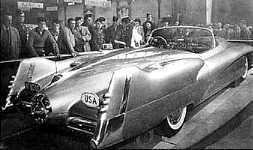 You may read more about the Cadillac Le Mans Motorama show car in the "Dream Cars" section (year 1953) of The (New) Cadillac Database©. Orleans is the name of another French town located approximately 80 miles east of Le Mans. Companion car to Le Mans dream car at the 1953 Motorama, the Cadillac Orleans - special order #1619 - was a 4-door, pillarless hardtop sedan, featuring so-called suicide doors in the rear. Front and rear clips were near-stock 1953 Cadillac. The doors on the production Eldorado Brougham models of 1957-58 copied this design. Although the racy Le Mans roadster stole the show during the 1953 Motorama, the Orleans received much more attention from the buying public. Without any doubt this is the car that most influenced the decision of Cadillac management to produce the Eldorado Brougham. From the Orleans, the production Eldorado Brougham borrowed the 4-door configuration with the rear doors hinged at the rear (so-called suicide doors), the wrap-around windshield, the absence of "B" pillars between the doors and - last but not least - the ultimate brushed stainless-steel roof. You may read more about the Cadillac Orleans, Motorama show car in the "Dream Cars" section (year 1953) of The (New) Cadillac Database©. GM/Cadillac special order #1928 was the 2-seater roadster La Espada - Spanish for the sword [it seems that the copywriters at Cadillac loved bladed weapons!]. 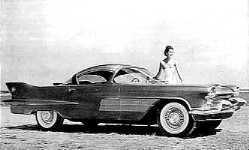 La Espada was on show during the 1954 GM Motorama with a companion car, El Camino, a 2-pass. coupe. Both cars had basically the same sheet- metal, including a rear deck that featured a camel- humped tonneau cover [on La Espada] and rear shelf [on El Camino]. The tonneau-cover was copied much later by Ford on their T-Bird models in the early sixties]. La Espada was painted Apollo Gold, a very light cream color with a metallic golden hue [some of the early color pictures suggest an off-white color]. Both La Espada and El Camino had steeply raked, wrap-around windshields. 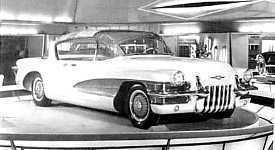 You may read more about the Cadillac La Espada, Motorama show car in the "Dream Cars" section (year 1954) of The (New) Cadillac Database©. This was one of two similar Cadillac show cars on display during the 1954 GM Motorama. El Camino - special order #1929 - is short for el camino real (the royal highway, in Spanish - i.e. US highway 101). Although somewhat chubbier in appearance, the tail-fins on this car, as also on La Espada, are similar in general height and shape to those used later on the production model Eldorado Brougham. The exhaust configuration, windshield, roof saddle, spoke wheels, quad headlights, fluted side panel, gull-wing bumpers with bullet tips, all appeared the following year on the Eldorado Brougham dream car. Also fitted with a Fiberglas body, El Camino made use of a light and structurally strong hand-brushed aluminum roof, carried between the windshield and Fiberglas saddle at the rear. A similar roof finish was used later on the production Eldorado Brougham. This car had also a wrap-around, tinted windshield. It incorporated styling and engineering features identical with those of La Espada. You may read more about the Cadillac El Camino, Motorama show car in the "Dream Cars" section (year 1954) of The (New) Cadillac Database©. Once again, the buying public at the 1954 Motorama paid much closer attention to Cadillac's experimental 4-door hard-top, he Park Avenue sedan, than to El Camino and La Espada. It was obvious that the latter cars would never be slated for production; on the other hand, the Park Avenue - special order #1930 - was a real possibility. This show-car went back to a dual headlight arrangement (quad headlights were to remain outlawed in many states until 1958). 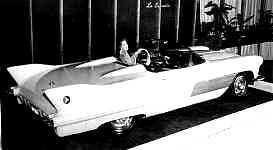 The tail-fins were copied directly from GM's 1951 Le Sabre experimental roadster. The windshield, front bumper, wheels all were carried over from previous Motorama models and were traditional of GM show-car styling. The brushed aluminum roof and rear roof saddle appeared again the following year, this time on the Cadillac Eldorado Brougham prototype. The dummy air-scoop on the rear door reappeared on the Cadillac Eldorado Brougham town car in 1956. The exhaust ports and seven vertical louvers serving as a rear bumper also had been used earlier on Le Mans, La Espada and El Camino. These vertical louvers reappeared as a stock trim feature above the rear bumper of all Cadillac models in 1955. 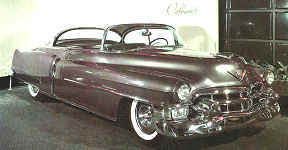 You may read more about the Cadillac Park Avenue, Motorama show car in the "Dream Cars" section (year 1954) of The (New) Cadillac Database©. Two lesser-known show-cars also were on display simultaneously with the Park Avenue sedan. 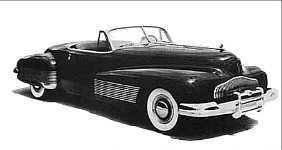 These were the Cadillac La Salle II, a 4-door, pillarless hardtop, and its companion car, the La Salle II roadster. Noteworthy on the sedan model was the so-called dog-leg "A" pillar and compound-curve or wrap-over windshield, extending far up into the roof area. The tall windshield feature appeared again on the production Cadillac Eldorado Brougham for 1959. The front of the La Salle II show-cars car was atypical of other Cadillac show-cars, although the small fender grilles above the front bumper ends did appear later on the production Cadillac models of 1957. The rear of these La Salle II show-cars emulated that of GMs earlier Corvette models. The LaSalle II sedan - experimental model #XP32 (special order #2217) - featured rear-hinged back doors (suicide doors), much like the Orleans and Park Avenue show cars. Designed to accommodate six passengers, nonetheless LaSalle II was mounted on a wheel base of only 108", when contemporary Cadillac models rode on chassis that were between 21 and 25 inches longer. You may read more about the Cadillac La Salle II, Motorama show sedan in the "Dream Cars" section (year 1955) of The (New) Cadillac Database©. The influence of Chevrolet's Corvette models was evident in this 2-seater roadster - experimental model #XP34 (special order #2220) - companion car to La Salle II [the sedan] at the 1955 GM Motorama. Here was an attempt by GM/Cadillac to revive the La Salle name, which had disappeared from Cadillacs model range in 1940. Other similar (but fruitless) attempts were made to revive that name again in the mid-sixties, and again on some of the early Seville prototypes in the early seventies. The two LaSalle II models featured vertically styled grille openings very reminiscent of the grille that had been planned for the anticipated 1941 La Salle. But the latter never went into production. Both cars also featured the LaS emblems that had been used already during the final years of La Salle production up to 1940. Prefiguring the 1956 Chevrolet Corvette, these show cars featured a concave side sculpture behind the front wheel opening. By using 13" wheels and low-profile tires, the car stood just slightly more than 4 feet above the ground, at exactly 50 inches. Although neither LaSalle II models were ever slated for production, many of their design features reappeared in later GM cars. The wraparound windshield went into production on many cars, beginning in 1957. The rear roof saddle was typical of many Cadillac models for 1957, as were also the textured ornaments at the leading edge of the front fenders. 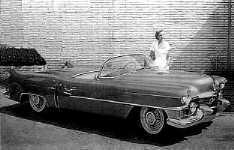 You may read more about the Cadillac La Salle II, Motorama show roadster in the "Dream Cars" section (year 1955) of The (New) Cadillac Database©.